Mrs Emma Ewokolo Gwan-nulla nee Najeme was born on the 6th of July 1942 in Muea, Buea, Cameroon. She excelled in primary school and went on to graduate from Okoyong Secondary School in Mamfe, Cameroon. She went on to study nursing at Lagos University Teaching Hospital in Nigeria, where she obtained the General Nursing Council diploma. She returned to Cameroon to begin work with the Cameroon Development Corporation (CDC). 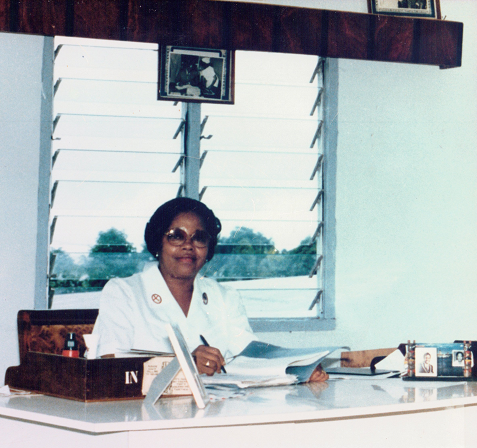 There, she met with and fell in love with her husband for 38 years, the late Dr Alexander Gwan-nulla. Thereafter, she gave birth to her son, Daniel. In the early seventies, she came to the UK to further her studies in nursing. She gained the general nursing council for England and Wales certificate of registration. She then obtained the central midwives board for Scotland and Wales certification and further went on to study otological nursing in which she obtained a diploma. Upon her return to Cameroon, she and her husband worked tirelessly in building one of the most successful private medical practices known in Cameroon at the time. Together with her husband, as well as with a unique team of doctors they assembled, they impacted the lives of many. In the late seventies, she returned to England to pursue further training in nursing, most of which was done in Oxford and included anaesthetic nursing in which she was awarded a diploma. She returned to Cameroon a few years later to continue practising with her husband. However, the onset of health problems began. She made frequent trips to Oxford for medical care. Due to the need for increased level of medical care, she subsequently moved to Oxford permanently. Despite years of dialysis, then kidney transplant and brain surgery, she battled her medical problems with tremendous courage and forbearance. Her life was especially enriched during the past decade with the arrival of her three grandchildren. She was a proud ‘grandma’ and cherished that title more than anything else. She was a devout Christian who cared deeply for others and was also very generous. After a very long and courageous battle with illness, she went home to be with the Lord on 14 September, 2013. She is survived by her mother, Mrs Mary Liengu Najeme; her son Dr Daniel Gwan-nulla; daughter-in-law Dr Meesha Gwan-nulla; grandchildren Emma, Abigail and Alexander; stepson Matthew Gwan-nulla; stepdaughters Mrs Elizabeth Nelson, Ms Anna Gwan-nulla, Mrs Chantal Nchanji and Mrs Lucy Fusi; brothers Honourable Sammy Najeme, Joseph Njacko Najeme, Hans Ekema Najeme; sisters Mrs Hannah Mulema, Ms Ruth Najeme, Mrs Mary Awusa and Ms Hannah Najeme. She is also survived by a loving extended family.